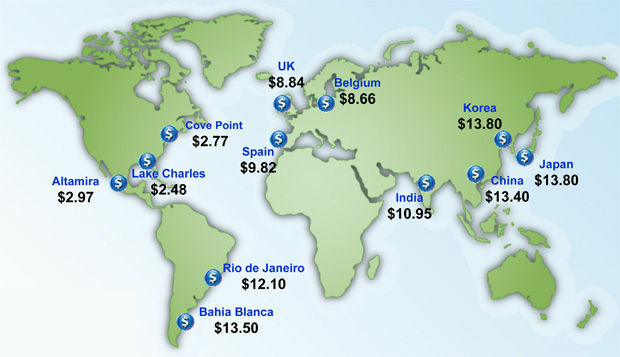 Brian Westenhaus presents an interesting look at natural gas prices around the world, and wonders why the US government is dragging its feet on LNG exports to the gas-hungry nations of Asia and Europe. For one answer to that question, one needs to look at the policies and behind-the-scenes machinations of the Obama administration and the US Democratic Party controlled Senate. One must assume that the Obama DOE and the US Senate have good reasons for obstructing policies that would increase prosperity for companies in the US private energy sector, but rational reasons for Obama's actions do not readily jump into the conscious mind. By 2020 or so...a flood of new oil and gas production will begin to wash over the world. Rather than general economic mayhem, there will be an economic shift: some rich countries will weaken, and hitherto marginal nations will take center stage. Under this new scenario, oil prices could average $80 a barrel, compared with $110 for Brent benchmark crude today. Gulf monarchs untouched by the Arab Spring could face unrest, as shrinking oil revenues limit their scope for giving handouts. Mozambique—yes, Mozambique—could become one of the most important petro-states on the planet. China could more congenially assume a top rung among global powers. And the US could untether itself from some tyrants. This vision of energy abundance stems from a series of new finds. Already, a natural gas revolution is under way in the US, where drillers armed with the new technology of hydraulic fracturing, or “fracking”, are pumping enormous volumes of natural gas from dense shale rock. America, on the verge of a gas deficit a few years ago, now has a century-long supply of the fuel. And fracking has now spread to shale oilfields. In states like North Dakota and Texas, it has brought an astonishing boost to US petroleum production. Obama is closing hundreds of coal powered electricity generating plants in the US -- creating the potential for dangerous instabilities in the 3-part national power grid structure. Obama has devastated the US offshore oil & gas industry, has stonewalled pipeline projects that would boost energy production from new US shale oil and Canadian oil sands projects, and has blocked a large number of proposed energy projects on federal lands. While talking in favour of shale gas out of one side of his mouth, his EPA is moving to make shale oil & gas production much more expensive. Across the board, the US Obama administration has blocked viable energy projects from hydrocarbons and nuclear sources -- while wasting many billions of stimulus dollars on big wind and big solar crony companies that are either already bankrupt or soon to become so. The long term effects of such energy starvation policies will result in widespread economic slowdowns and unnecessary human suffering. Is that what the Obama administration wants to happen? No one knows, or if they do, they are not telling.